Section 68 of the Goods and Services Tax Act mandates that the Government may require the person in charge of a conveyance carrying any consignment of goods of value exceeding such amount as may be specified to carry with him such documents and such devices as may be prescribed. Rule 138 of Karnataka Goods and Services Tax Rules, 2017 prescribes e-way bill as the document to be carried for the consignment of goods of value more than rupees fifty thousand . Government has issued a notification under rule 138 of Goods and Services Tax Rules, 2017 mandating to carry e-way bill for transportation of goods of consignment of value more than rupees fifty thousand. Hence e-way bill generated from the common portal is required to be carried. Every registered person who causes movement of goods of consignment value exceeding fifty thousand rupees in relation to supply; or reasons other than supply; or inward supply from unregistered person shall generate e-way bill. It means, the consignor or consignee, as a registered person or a transporter of the goods can generate the e-way bill. The unregistered transporter can enroll on the common portal and generate the e-way bill for movement of goods for his clients. Any person can also enroll and generate the e-way bill for movement of goods for his/her own use. To generate the e-way bill, it is essential that the person shall be registered person and if the transporter is not registered person it is mandatory to get enrolled on the common portal of e-waybill(http://gst.kar.nic.in/ewaybill) before generation of the e-way bill. The documents such as tax invoice or bill of sale or delivery challan and Transporter’s Id, who is transporting the goods with transporter document number or the vehicle number in which the goods are transported. There may be some transporters, who are not registered under the Goods and Services Tax Act and if such transporters cause the movement of goods for their clients, they are required to generate the e-way bill on behalf of their clients for update the vehicle number for e-way bill. Hence, they need to enroll on the e-way bill portal and generate the 15 digits Unique Transporter Id. No. One needs to transport the goods with a e-way bill specifying the vehicle number, which is a carrying the goods. However, where the goods are transported for a distance of less than ten kilometers within the State from the place of business of consignor to the place of transporter for further transportation, then the vehicle number is a not mandatory. WHAT AFTER E-WAY BILL IS GENERATED? All the registered persons under GST shall also register on the portal of e-way bill namely: http://gst.kar.nic.in/ewaybill using his GSTIN. Once GSTIN is entered, the system sends the OTP to his registered mobile number and after authenticating the same, the system enables him to generate his/her username and password for the e-way bill system. After generation of username and password of his choice, he/she may proceed to make entries to generate e-way bill. If the consigner or consignee is unregistered tax payer and not having GSTIN, then user has to enter ‘URP’ [Unregistered Person] in corresponding GSTIN column. Yes. As per the rules, e-way bill is required along with the goods, if it is more than Rs 50,000.00. Under this circumstance, the consumer can get the e-way bill generated from the tax payer or supplier, based on the bill or invoice issued by him. Or the consumer can enroll and log in as the citizen and generate the e-way bill. E-way bill has to be updated with transport document details within one hour of submission and collection of transport document from rail/air/ship authority. Ideally, Part-B has to be updated before movement of goods from the place to submission. One e-way bill can go through multiple modes of transportation before reaching the destination. As per the mode of transportation, the EWB can be updated with new mode of transportation by using ‘Update Vehicle Number’. Let us assume the goods are moving from Cochin to Chandigarh through road, ship, air and road again. First, the tax payer generates the EWB by entering first stage of movement (by road) from his place to ship yard and enters the vehicle number. Next, he will submit the goods to ship yard and update the mode of transportation as Ship and transport document number on the e-way bill system. Next, after reaching Mumbai, the taxpayer or concerned transporter updates movement as road from ship to airport with vehicle number. Next the tax payer or transporter updates, using ‘update vehicle number’ option, the Airway Bill number. Again after reaching Delhi, he updates movement through road with vehicle number. This way, the e-way bill will be updated with multiple mode of transportation. • The transporter can go to reports section and select ‘EWB assigned to me for trans’ and see the list. • The transporter can go to ‘Update Vehicle No’ and select ‘Generator GSTIN’ option and enter taxpayer GSTIN, who has assigned or likely to assign the EWBs to him. • The tax payer can contact and inform the transporter that the particular EWB is assigned to him. Some of the consignments move from one place to another place till they reach their destinations. Under this circumstance, each time the consignment moves from one place to another, the transporter needs to enter the vehicle details using ‘Update Vehicle Number’ option, when he starts moving the goods from that place or the transporter can also generate ‘Consolidated EWB’ with the EWB of that consignment with other EWBs and move to the next place. This has to be done till the consignment reaches destination. But it should be within the validity period of EWB. There is a chance that consignee or recipient may reject to take the delivery of consignment due to various reasons. Under such circumstance, the transporter can get one more e-way bill generated with the help of supplier or recipient by indicating supply as ‘Sales Return’ and with relevant document details and return the goods to supplier as per his agreement with him. If the addresses involved in 'Bill to' and 'Ship to' in a invoice/bill belongs to one legal name/tax payer as per GSTIN within the state, then one e-way bill has to be generated. That is, if the 'Bill to' is principal place of business and 'Ship to' is additional place of business of the GSTIN or vice versa in a invoice/bill, then one e-way bill is sufficient for the movement of goods. If the addresses involved in 'Bill to'and 'Ship to' in a invoice/bill belongs to different legal names/tax payers, then two e-way bills have to be generated. One e-way bill for first invoice, second e-way bill is from 'Bill to' party to 'Ship to' party based on the invoice/bill of the 'Bill to' party. This is required to complete the cycle of transactions and taxes will change for inter-state transactions. For example, A has issued invoice to B as 'Bill to' with C as 'Ship to'. Legally, both B and C are different tax payers. Now, A will generate one e-way bill and B will issue invoice and generate one more e-way bill. As goods are moving from A to C directly, the transporter will produce both the invoices and e-way bills to show the shortcut movement of goods. Consolidated EWB is like a trip sheet and it contains details of different EWBs which are moving towards one direction, and these EWBs will have different validity periods. Hence, Consolidated EWB is not having any independent validity period. However, individual EWBs in the Consolidated EWB should reach the destination as per its validity period. Some of the transporters move the consignments from one place to another place as per the movement of vehicles. Sometimes the consignments move to 8-10 branches of the transporter before they reach its destination. The consignments reach the particular branch of transporter from different places in different vehicles and again these consignments will be sorted out to transport to different places in different vehicles. Now, the concerned branch user instead of updating the vehicle for each one of the EWBs, he can generate ‘Consolidated EWB’ for multiple EWBs which are going in one vehicle towards next branch/destination. This will simplify the managing of the EWBs and data entry. Generally, registered GSTIN holder will be recorded as supplier or recipient and he will be allowed to work as supplier or recipient. If registered GSTIN holder is transporter, then he will be generating EWB on behalf of supplier or recipient. He needs to enter both supplier and recipient details, which is not allowed as a supplier or recipient. To change his position from supplier or recipient to transporter, the tax payer has to select the option ‘Register as Transporter’ under registration and update his profile. Once it is done with logout and login, the system changes tax payer as transporter and allows him to enter both supplier and recipient as per invoice. TRAN-SIN or Transporter id is 15 digits unique number generated by EWB system for unregistered transporter once he enrolls on the system. TRAN-SIN is 15 digits number on similar lines with GSTIN and it is based on state code, PAN and Check digit. This can be shared by transporter to his clients to enter this number while generating e-waybills. The transporter is required to provide the essential information on the EWB portal. The transporter id is created by the EWB system after furnishing the information and submitting. It is a 15 digits number on similar lines with GSTIN and it is based on state code, PAN and Check digit. This can be shared by transporter to his clients to enter this number while generating e-waybills. While generating e-way bill the tax payer has a provision to enter the transporter id in the transportation details section. If he enters 15 digits transporter id provided by his transporter, the e-way bill will be assigned to that transporter. Subsequently, the transporter can log in and update the further transportation details to it. 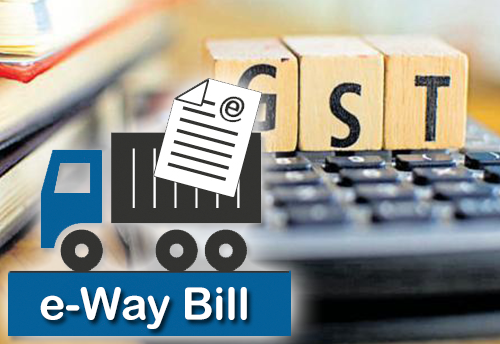 As per rules, the tax payer or recipient can reject the e-way bill generated on his GSTIN by other parties. The following options are available for him to see the list of e-way bills. • He can see on the dashboard, once he logs into the system. • He can go to report and see the ‘EWBs by other parties’. The user is allowed to generate report on daily basis. Because of criticality of the system for performance and requirement of 24/7, the reports are limited to be generated for a day. The user can change date and generate the report for that date. Hence, the user is advised to generate report daily and store in his system. API interface is a site-to-site integration of website of tax payer with the EWB system. API interface can be used by large tax payers, who needs to generate more than 200 invoices / e-way bills per day. However, the tax payer should meet the following criteria to use the API interface. • He should be generating at least 200 invoices/e-way bills per day. API interface is a site-to-site integration of two systems. Using this, the tax payer can link his IT system with EWB system to generate EWB directly from his IT solution without keying in the EWB form. This reduces the duplicate data entry and eliminates the data entry mistakes. Presently taxpayer generates invoices from his IT system and logs into EWB system and enters e-way bill requests and generate e-way bills. Here, the tax payer has to make double entries – one for Invoice generation in his system and second for e-way bill generation. If he integrates API interface with his system to EWB system, he can avoid this. That is, he can avoid duplicate entry of invoice details for e-way bill generation. He can save the manpower cost of operator for this purpose. Secondly API interface will eliminate data entry mistakes/errors being made by operator. It also saves time. Thirdly e-way bill number can be stored by the tax payer system in his database with the corresponding invoice. EWB system has an option to enter the masters of user – client master, supplier master, transporter master and product master. If user creates these masters, it will simplify the generation of e-way bill for him. That is, the system auto populates the details like trade/legal name, GSTIN, address on typing few character of client or supplier; HSN Code, tax rates etc., in case of product. It also avoids data entry mistakes by operator while keying in the details. Most of the times, the tax payer or authorized person himself cannot operate and generate EWBs. He will be dependent upon his staff or operator to do that. He would not like to avoid sharing his user credentials to them. In some firms, the business activities will be operational 24/7 and some firms will have multiple branches. Under these circumstances, the main user can create sub-users and assign the roles to them. He can assign generation of EWB or rejection or report generation activities based on requirements.